Earlier in the day, the Senate confirmed Thomas Perez as labor secretary. Republicans on the Senate Environment and Public Works Committee boycotted a committee vote for McCarthy in May, saying the EPA had not answered a series of questions about the nominee. Once the agency pledged to answer the questions, Republicans in the committee dropped their objection to holding a vote. Their requests included new policies and a review of using private e-mail accounts to conduct official business and greater transparency in the agency rule-making process. "I am so pleased that the full Senate has confirmed Gina McCarthy to be EPA administrator, because she is the right person for the job," Democratic Sen. Barbara Boxer, chairman of the committee, said in a statement Thursday. Obama nominated McCarthy in March and confirmation hearings were held in April. 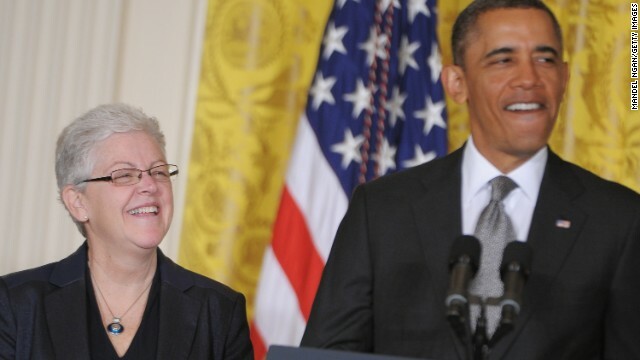 "As assistant EPA administrator, Gina has focused on practical, cost-effective ways to keep our air clean and our economy growing," Obama said when announcing her nomination in March. "She's earned a reputation as a straight shooter. She welcomes different points of views. I'm confident that she's going to do an outstanding job leading the EPA." McCarthy is replacing Lisa Jackson, who stepped down earlier this year. Good job Harry Reid and John McCain. It's sad that members of the senate have to be threatened with the nuclear option in order for things to get accomplished. Sen. McConnell is losing credibility within his caucus. I just hope the voters of Kentucky see it the same way. Job Killer ! Bill Clinton's Economy PROVED that, in America, you can not have Environmental Regulation AND Economic Prosperity. Lost 900,00 jobs per month in the last years of his Presidency ! Sorry, that was George W.; Clinton saw the creation of 22 MILLION jobs. "Clinton saw the creation of 22 MILLION jobs." After raising taxes, no less. With a Republican Senate and a Republican House, no less. And there he is, folks... Mr. NoPerspective!!! Yay!!! If you are against environmental regulations then you have been duped by these corporations who want to protect their all mighty profits and could care less about your health. We should take our anger out on the greedy people not the people who want to stop them from spewing harmful gases and chemicals in OUR air and water. Wake up! These corporate jerks are laughing at you!! There goes thousands more jobs.......off shore. While no starting any UNFUNDED WARS unlike the ones that typically and practically unanimously supported AND DEMANDED by Republican Congressmen; both House & Senate. Yeah, it's called the take off of the internet and the dotcom bubble, which burst right was Clinton was leaving office and Bush was handed a recession on his first day in office. Where are Obama's big economic ideas? Failed green energy boondoggles for his campaign contributors? Borrow trillions a year and spend it? 5 years later, still at record unemployment levels and drowning in Obama debt as the economy barely keeps its head above water. F-A-I-L-U-R-E.
Yah and Clinton did it adding EPA regulations something Bushs,Cheney stripped when they came into town..Just ask all the people suffering because the EPA can't go against fracking,natural gas corporations like Halliburton because Cheney made it so during his stint as VP! !Watch Gas Lands 2 and you'll see what Cheney destroyed when he became VP,it'll make you sick,it did me..Cheneys just a traitor that's all and should be hung for everything he's done to America and its people! !